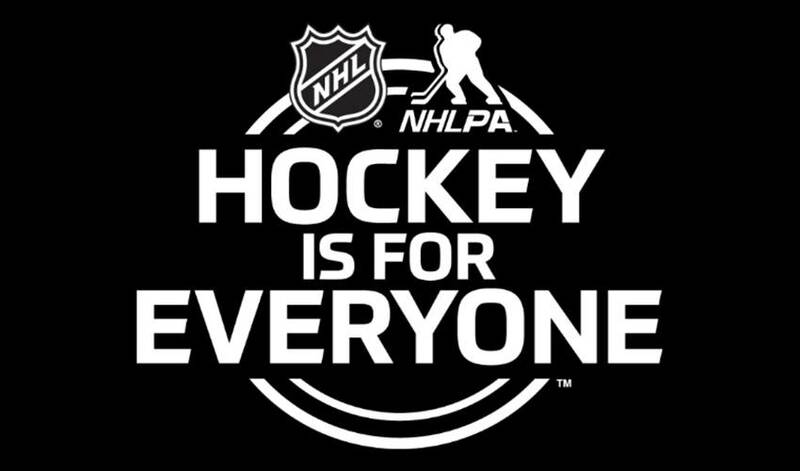 The NHLPA and the NHL are celebrating Hockey Is For Everyone throughout the month of February. Hockey Is For Everyone activities are scheduled every day of the month and focus awareness on such causes as LGBTQ rights, ethnicity and gender equality, socio-economic status, and those with disabilities. The campaign is conducted in partnership with the You Can Play Project - a nonprofit group committed to supporting the LGBTQ community and fighting homophobia in sports. Every NHL team has selected an ambassador in their support of the You Can Play campaign specifically. A testament to the campaign’s commitment to both inclusion and education, Andrew Shaw, once fined and suspended for directing a homophobic slur at an official, made the decision to represent the Montreal Canadiens this year. "[You Can Play] brought it to the team and I thought it would be a good opportunity to help out. What I went through last year, I learned from it. Words affect people more than you think, and that's something that I learned," said Shaw to a large media scrum following a Canadiens practice. For a full list of You Can Play player ambassadors, click here. A number of events have taken place so far this month, and the impact of the initiative hasn’t gone unnoticed by leaders of local LGBTQ sports communities, who have also noticed a positive change towards inclusion in conversation, most noticeably, the increased lack of need for it. "I think it's that the NHL has taken a position of leadership where you can be who you are and just be a good hockey player," said Chris Murray, commissioner of the Toronto Gay Hockey Association (TGHA) ahead of You Can Play Awareness Night in Toronto. "If you can play, you can play. I love that. What's even more impressive is sometimes it's not even a conversation anymore because a lot of people just don't care, which is really the way it should be." Jujhar Khaira, an Edmonton Oilers forward and third Indo-Canadian to play in NHL, recently echoed the sentiment of inclusion in terms of the game's growing ethnic diversity. "Everybody I've played with, I've never felt excluded," he said. "Always felt welcome. That's from Day One. There's always a few people that you run into or play against where emotion will get high and stuff gets said, but since I've been a pro, not much of that. "A hockey team is like a family and I don't think anybody, especially myself, has ever been excluded or not felt part of it in any way." Darryl Sittler met with members of the Toronto Gay Hockey Association ahead of the Toronto Maple Leafs You Can Play night. Kyle Turris poses with Capital City Condor players, a family of ice hockey teams for those with physical and/or intellectual disabilities after he and his wife, Julie, hosted the team at an Ottawa Senators game. Emirati Ice Hockey star and Hockey Is For Everyone ambassador Fatima Al Ali had an incredible week, topped off by the selfie of a lifetime. Ahead of the Buffalo Sabres hosting their You Can Play night at KeyBank Center, the team made a generous donation to benefit youth services of Western New York. Calvin de Haan, Anthony Beauvillier, and Scott Mayfield of the New York Islanders competed in a wheelchair hockey game against Henry Viscardi School at The Viscardi Center on February 1. "We enjoyed it, I think, more than they did, maybe,” said Scott Mayfield of the event. “It's not an easy sport out there. It's definitely harder than what we do on the ice. My forearms are pretty tired." Ambassador or not, Patrice Bergeron knows that the issues being tackled during this campaign, extend past the ice. The Washington Capitals haven’t even held their Hockey Is For Everyone night, and already, Braden Holtby has put his his You Can Play themed helmet for auction, to be worn on Feb. 24. The Capitals also hosted an Extreme Recess Hockey Clinic at Kettler Capitals Iceplex, representing the team's seventh-consecutive year teaming up with Dreams for Kids DC (DFKDC). For the entire month, players have been using Pride Tape-wrapped sticks, along with jerseys, to benefit You Can Play. For more information on Pride Tape, visit their PrideTape.com. Willie O'Ree, who broke the colour barrier in the NHL with the Boston Bruins in 1958, is also an ambassador for diversity in hockey, and took part at the 2017 Winter Sports Celebration along side P.K. Subban in New York. O'Ree has been involved with the Hockey Is For Everyone program as its director since 1998, and was given a standing ovation on Feb. 7 during a New York Rangers game. Follow the #HockeyIsForEveryone and #YouCanPlay hashtags for more as the month continues.